Maria Price worked as an editor for a medical publishing company for several years. She now does freelance editing and writing for various companies both in and out of the medical field. Price has a Master of Science degree from Drexel University in publications management. Newborn babies often have irregular sleep and breathing patterns that distress their parents. In most cases, grunts and other noises are harmless. However, they can indicate a more serious condition. It’s important to know the causes and signs so you can alert your pediatrician. According to the website, What To Expect, newborns are still developing breathing control patterns. As a result, grunting and rapid breathing may ensue. 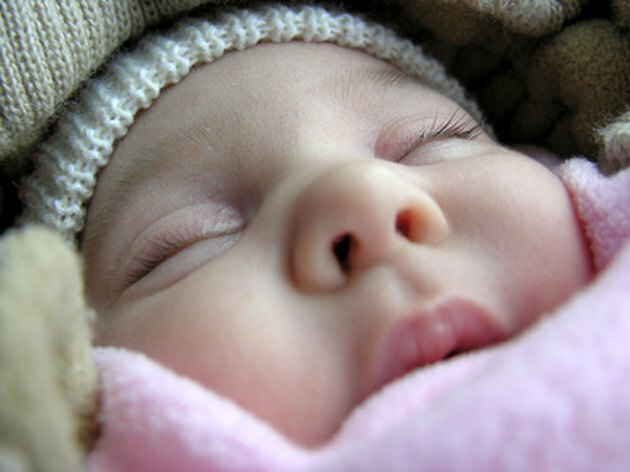 During waking hours, a newborn typically takes about 40 breaths per minute. However, during sleep time, the breathing pattern can slow to 20 breaths per minute. Some infants may also have brief periods of short, shallow breaths followed by a pause, no longer than ten seconds, of no breathing at all. While this is understandably frightening for parents, it’s a normal part of a baby’s development. Aside from irregular breathing patterns, there are many potential reasons an infant may grunt in her sleep, but most of them aren’t a cause for concern. First, it’s possible for babies to pass bowel movements in their sleep which could result in some grunting. If you wake up to your baby grunting, check her diaper to determine if this was the cause. If the grunting is irregular and not too severe, your baby may just be dreaming. What To Expect notes that when grunting occurs regularly at the end of each breath, it could be a sign that your baby is having trouble taking in enough air. Call your pediatrician immediately. Your baby might just have a cold or other minor respiratory problem, but it’s important to determine the cause before it leads to something more severe. Neonatal respiratory distress is a potentially fatal condition that occurs when a baby’s lungs have not fully matured. It’s most common in premature babies, but babies born at full term can suffer from it as well. Medline Plus notes that signs of neonatal respiratory distress include a blue color to the skin, brief pauses in breathing, decreased urine output, grunting, nasal flaring and unusual breathing movements, such as drawing in the chest muscles. If you notice signs of neonatal respiratory distress or if your infant stops breathing for more than 10 seconds, call 911. A baby’s sleep patterns can keep parents awake at night. Fortunately, grunting and other abnormal breathing sounds are most common in infants. As your baby’s brain and lungs continue to mature, you should notice that she sleeps more soundly through the night, and hopefully you will, too. There are two pieces of equipment that can be useful for monitoring your baby’s sleep. The first is a baby monitor. Even if the baby’s room is close enough to your own that you’ll hear her cry, you may want to keep the monitor on at night so you can detect grunts or other signs that may indicate abnormal breathing. Another piece of baby equipment that parents may find useful is a movement monitor. Movement monitors detect the slightest baby movements. If there’s no movement for approximately 20 seconds, depending on the brand you use, an alarm will sound. Although pricey, these monitors can provide parents with peace of mind. What Are the Causes of Infant Snoring?